Please Scroll Down For Additional Details. Saturday, December 17 from 6:00 to 10:00pm. Look Here for more details! A nine day happening of photography, painting, sculpture, video, performance art, spoken word, live music, artist talks, food and live community art making. ​Featured Artists: Gason Ayisyin, Dylan Cruz Azaceta, Brian Barbieri, Adrienne Battistella, Sheri Lynn Behr, James Billeaudeau, Bottletree, Suzette Bross, Sean G. Clark, Kimberly Coleman, Ian Chrystal, Dorit Jordan Dotan, Mya Ebanks, Michael Fedor, Andrew Feiler, Cecelia Fernandes, Ashley Gates, Miro Hoffman, Beryl Johns, Rodger Kamenetz, Krista Dedrick Lai, David McCarty, Samantha Melfi, Ti-Rock Moore, David Rae Morris, Kel Mur, Owen Murphy, Victoria Posey, Steve Prince, Michael Ramsey, Jacqui Roche, Jason Rodriguez, Matthew Rosenbeck, Dread Scott, Colleen Shannon, Leona Strassberg Steiner, Dan Tague, Tranche, Antonia Tricarico, Mary Lou Uttermohlen, Jordan Wade, Alan Walker, John Isiah Walton, Peter Williams and ZenBeatz. 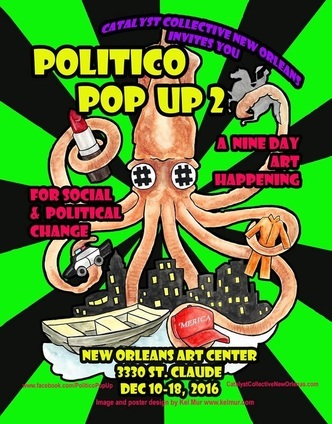 Politico Pop Up 2 is made possible with support from the New Orleans Art Center, the Charitable Film Network and Catalyst Collective New Orleans. Contact catalystcollective2016@gmail.com for more information. Featuring artwork by Bottletree, Charlie Steiner, Kel Mur, Leona Strassberg Steiner, Miro Hoffman and Sean Gerard Clark. Curated by Kel Mur. Contact catalystcollective2016@gmail.com for more information. This pop up was created in solidarity with Black Lives Matter to broaden the public consciousness to the struggles of Black Lives in a white dominated society. For more information contact: catalystcollective2016@gmail.com. ​WE ARE: Kimberly Coleman, Charlie Steiner, Christina Juran, Jakob Rosenzweig, Bottletree, Miro Hoffman, S. Gerard Clark and Leona Strassberg Steiner.